For the longest time, I've counted Caress of Steel among my favourite albums of Rush. It's far from being their best or most inspired (take your pick from any of the five albums that followed this for that accolade), but I'll never let up thinking that this was Rush at their most daring and risky. Even with two solid albums and an already-distinctive sound under their belts, underwhelming sales made their future look pretty bleak. The answer to this problem, of course, was to write music that would attract mass appeal. "Working Man" was a great rock anthem, even songs like "Fly By Night" and "In the Mood" were evidence of radio potential. That Rush decided to work against intuition and pack their third album with prog rock bombast at a time where the genre was falling out of favour is kind of amazing. The two ambitious epics packed into Caress of Steel pull no punches; in the face of commercial extinction, Rush didn't flinch. They stayed true to themselves, and refused to compromise where they wanted to go with their music. What's more amazing still, is that I'm writing this at a time where Rush stands as one of the most profoundly successful bands in history. Even if they've never sought to strike FM waves and get popular, it happened anyway. 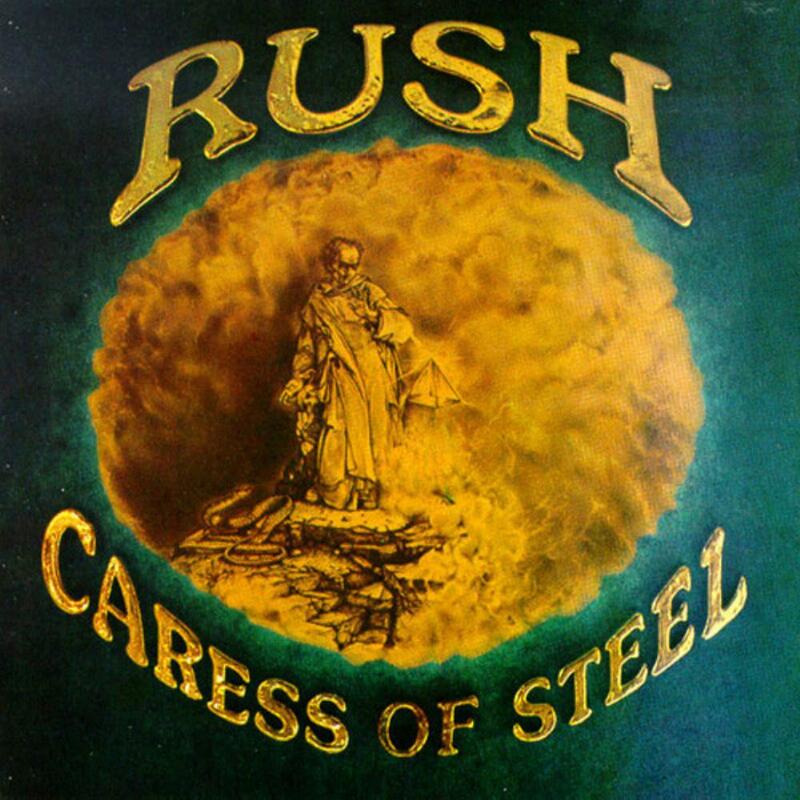 Caress of Steel marks the first album where it truly sounds like Rush are getting truly comfortable with themselves. Fly By Night experimented with prog (see: "By-Tor & the Snow Dog") but never surrendered itself to the possibility that the band's future might lie in that approach. Caress of Steel still has some of the pop-oriented rock numbers that defined the first pair of albums, but they're dwarfed in significance by "The Necromancer" and "The Fountain of Lamneth", both of which rank among my favourite early Rush tracks. For the first time in their career (though far from the last), they had crafted a record with no weak links. Even the least impressive offering here, undoubtedly "I Think I'm Going Bald", serves an important role alongside "Lakeside Park" as an upbeat poppy contrast to the harrowing prog rock later on. Of the three shorter pieces here, there's little doubt that "Bastille Day" is the strongest. It may not have been the nigh-unbeatable opener that "Anthem" was, but the fusion of energetic rock with the aristocratic pomp of its bridge section is particularly clever. "I Think I'm Going Bald" is decidedly less iconic; I can see why the tongue-in-cheek rocker doesn't get discussed much, but it's enjoyable and to-the-point. While there isn't much more than that to be said about the token pop song "Lakeside Park", it does strike me as a really effective use of time. In three minutes, Rush manage to transport the listener to a specific time and place; I've never been to Lakeside Park (and haven't visited Toronto in several years) but I get a crisp mental image of the place through their lyrics. It's a pleasant song for summertime. If the rest of the album were just like that, it probably wouldn't leave much of an impression, but it would be the perfect thing to put on when I needed a pick-me-up. When it comes to the epics, Rush weren't so experienced with longform composition at this point. Yeah, "The Necromancer" is leisurely, maybe a little self-involved. "The Fountain of Lamneth" is a greater part episodic than naturally cohesive. But both of them are amazing. They're both rare cases of music that provide a gateway into another reality. Rush's vision of high fantasy is Tolkien-inspired to the point of feeling like a cheap knock-off (in a sense, they paved the way for generations of power metal bands) but it doesn't matter. Regardless whether the content isn't original, Rush make you believe in it. The gloomy psychedelic distortions in "The Necromancer" paint a grim picture of a wasteland where nothing grows. "The Fountain of Lamneth" is even more successful in this way; the epic revolves around a young man's search for immortality. The suite not only conveys his physical journey, but his emotional arc as well. When we first meet the hero, he is restless and confident ("In the Valley"). By the reprise, he is world-weary and tired, discouraged with the realization that reality often fails expectation. The music and lyrics work together to create a mental image just as vivid as "Lakeside Park". From a point of technical structure, Rush didn't create the sense of a completely coherent start-to-finish epic until the year after with "2112" (which stands among the most perfect prog epics ever) but the rough edges here are easy to overlook. Rush are all-too eager to take the listener on a journey, and I'm all-too eager to oblige them. On a personal note, "The Fountain of Lamneth" had a powerful significance to me in my late childhood. I was having a tough time adjusting to my own realization that my dreams seemed made to be broken. I wanted to escape, to find my way beyond the nagging circumstances of my situation and, speaking now in hindsight, have what at the time was hideously implausible. Like the hero of "The Fountain of Lamneth", I struggled with the dissonance between reality and expectation. However, his final consolation struck a heavy note with me. "Still... I am." Instead of finding what he set out for, his quest awarded him the gift of perspective and maturity, to be thankful for the life he has himself. Even if the string of masterpieces reaching from this to Signals in 1982 might make Caress of Steel look primitive in comparison to some of Rush's other work, the album will always hold a special place with me.